Published on 4 September 2006. 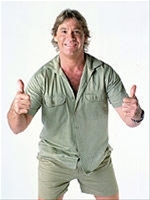 I’m waking up this morning to the news that the ‘Crocodile Hunter’, Steve Irwin, has been killed in an accident whilst filming his latest documentary. He died about six hours ago after a stingray attack to the chest in the Batt Reef of the Low Isles, near Cairns in Australia. The Sydney Morning Herald has full details. This is really quite a shock. I think we all knew that what Steve did in his documentaries was almost ludicrously dangerous, but I don’t think anyone ever expected him to die. In the modern age of special effects and stuntmen, perhaps the dangers people put themselves through for their art are never truly recognised. The bitter irony is that few people are killed by stingrays – the life of a naturalist famed for working with the most dangerous of animals has been ended by a common, often harmless creature. Steve leaves behind wife Terri, daughter Bindi (8), and son Bob (2). My thoughts are with them this morning. This 956th post was filed under: News and Comment. Comment posted at 18:28 on 5th September 2006. God bless him. I really enjoyed his documentaries. Comment posted at 18:48 on 5th September 2006. Will be greatly missed. Thoroughly enjoyed watching him on tv and what a happy go lucky chap. Comment posted at 19:06 on 7th September 2006. Comment posted at 19:40 on 13th September 2006. I’m 12yrs old and my Mum woke me to tell me in tears around 7am as i woke for school. I held my tears through school untill i got home to Mum in on her own and then sobbed uncontrolably for the Man i placed on a Pedistal. I can see you and hear your voice anytime Steve on my DVD’s. Take care of my Grandma up with the Angels please.